Half of the world’s population live below the poverty level. Much of the increase in national wealth goes to a very small portion of the population. What Gates is referring to is the wealth of the country itself. National wealth is usually defined in terms of gross domestic product. Gross domestic product in technical terms is the officially recognized value of goods and services produced within a country in a year. For example, large countries with many resources have a high GDP such as China and the Unites States. Small countries with few resources have a small GDP. Indeed, the gap in wealth and income by country is decreasing. Implicit in Mr. Gates forecast is that there will be almost no poor people left in 20 years. Personal wealth is very different from national wealth. The average wealth of the population is often expressed as the GDP per person. What the GDP per person doesn’t tell us: Much of the increase in national wealth goes to a very small portion of the population. It is the same in the developing countries as it is in the United States and Europe. Technology is replacing human labor worldwide resulting in increased unemployment and poverty. Nearly half the world’s people live in countries where the per capita GDP is less than $500 a year! In 1950 the average income in the industrialized countries was 30 times that of the developing countries. By 2001 it was 90 times larger. Worldwide the number of people living below the poverty level increased from 1.2 billion in 1987 to over 1.7 billion in 2007. Estimates suggest the number living in poverty may reach two billion by 2015. It is a global situation in which the majority of people live in poverty while the few get richer and richer. So great is the discrepancy in wealth in the world that the assets of the three richest billionaires own more than the combined wealth of half a billion living in the poorest countries. Most nations of Western Europe relieved the pressure on the land by making new industrial jobs available in the cities to which the surplus rural population moved. Developing countries have not been able to expand urban job opportunities rapidly enough to meet the demand. Unemployment combined with underemployment averages 40 to 60 percent in most of these poor countries, and during the next twenty years, the number of people entering the labor force will double. However, there are disparities within developing countries as large as between the developed and developing countries. Indeed, the income gap is greatest within the poorest countries where leaders have often been those who have most strongly criticized the international disparities of income and consumption. Moreover, within these poor countries, the per capita income of the wealthiest one-fifth of the population is frequently 20 to 25 times that of the poorest fifth. This is especially true of the nations of Latin America, Africa, and Southwest Asia. The growing disparity is the result of a number of factors. One of these factors in the economic and hunger gap is the continued high rate of population growth in the developing countries. If the growth rate of the population is greater than the growth rate of the national wealth then the increased wealth of the nation is spread over an ever growing number of people. In this case the average wealth for each person goes down. In most African countries the growth rate of the population is greater than the growth rate of the national wealth. Palm oil is used in many packaged foods and in cosmetics. Demand has skyrocketed. In recent years in response to demand trans-national corporations have been buying up agricultural landing in the tropical regions to grow the trees from which the oil comes. By 2012, some 140 million acres of land in Africa had been converted from subsistence farms and forest to oil palm plantations. Much of this land was taken from the farmers with minimal or no payment for the land. The corporations bought or leased from the government which claims it owns all the land. One company in Liberia leased more than 500,000 acres of land from the government. The primary investors were from Asia. Another company leases more than 750,000 acres in the same country. Bridgestone-Firestone operates a 200 square mile operation here as well. The impact of the resident population is horrific. Most of the resident population is left without their farm land and without payed employment. The government of Liberia acknowledges that an estimated 85% of the population is constantly hungry, if not malnourished. The same process is taking place in many countries in Africa. The taking of land from the resident population is occurring on other continents. It is well documented in Malaysia and other Southeast Asian countries. As Bill Gates suggests, most poor nations will see increases in their total wealth between now and 2035. However, the prospects for much of the population in the poor countries are not good. Most of the increase in national wealth will go to just a few people, many of whom are not even residents of the counties in which their companies operate. It should be clear that the income gap is contributing to global unrest and increased violence. One can only conclude there will be more and more civil uprisings by ever large numbers of people as they protest the continual decrease in income and resources available to them. There will also be more and more migration of people looking for better opportunities. 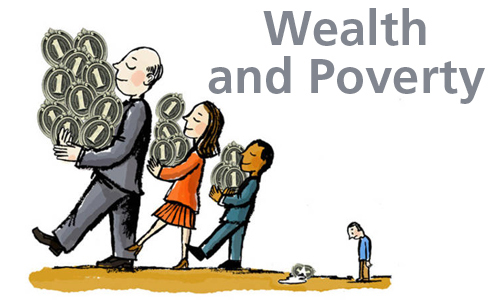 Categories: Population, Poverty | Tags: Distribution of Wealth, Population, Poverty | Permalink.